While we’re baking here on the Costa del Sol in temperatures that never seem to drop below 30 degrees, my thoughts often turn to summers spent in the north of Spain, Galicia in particular, where the climate is not dissimilar to Britain and the coastline reminiscent of Scotland. Galicia is famous for its wonderful Atlantic seafood, particularly octopus and percebes (barnicles precariously gathered off the rocks by sure footed men risking life and limb to gather them), and the best white wine in Spain, Alberiño. However it is also famous for the city of Santiago de Compostela, the destination of many pilgrims from all over the world who travel along one of the Caminos de Santiago to pay homage at the shrine of Saint James (Santiago). One year, when we were holidaying in Galicia, we spent a few days in Santiago de Compostela and saw the city flooded with footsore and weary pilgrims, some of whom had walked nearly a thousand kilometres to get there and others who had travelled on bicycle. We passed a small office behind the cathedral where many were queuing to have their pilgrims’ passports stamped and receive their compostelas, the certificates that prove they have actually completed the pilgrimage. 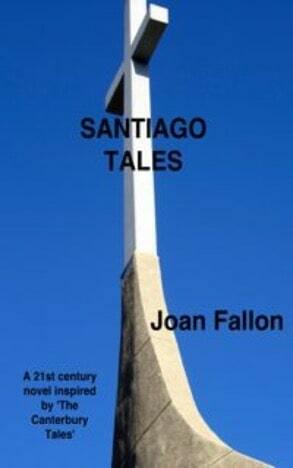 As I wandered around the city, I thought about Chaucer’s ‘Canterbury Tales’ and a idea for a novel, loosely based on that famous book, came to me; when I got home I started to write Santiago Tales. Beth is a woman whose life is falling apart; there are problems with her marriage, her career is in the doldrums and her health is not good. She decides she has to get away from it all and find some peace of mind, so she embarks on a pilgrimage to Santiago de Compostela. As she walks the five hundred miles across the north of Spain she is tested both physically and emotionally. She reaches the depths of despair and feels that her life is not worth living but gradually, through her encounters with other pilgrims, a soldier injured in Afghanistan, a woman who is looking for her lost son, a devout nun, a widower who thinks his life is over and many others, she becomes stronger and regains the will to live. Each pilgrim that she meets has a tale to tell and everyone has some secret in their life. When she arrives in Santiago de Compostela, five weeks later, she realises that the journey has changed her in a way she never expected.